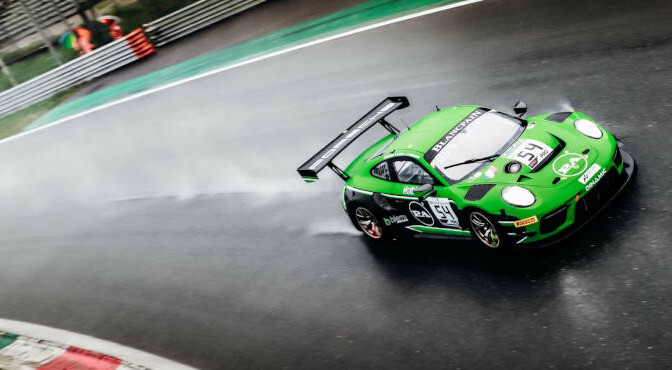 Dinamic Motorsport scored a phenomenal debut victory in the season-opening Blancpain GT Series Endurance Cup contest at Monza thanks to a flawless performance from its #54 Porsche 911 GT3 R crew of Andrea Rizzoli, Zaid Ashkanani and Klaus Bachler. The series newcomer toppled the established order by triumphing on home soil to spark emotional sconces in the garage, giving the Porsche brand its first Endurance Cup victory since 2012 in the process. The win came in uniquely challenging conditions as heavy rain overnight and throughout Sunday morning left Monza soaked for the race start. While this would prove the undoing of some, it gave the Dinamic squad a platform to excel. The #54 Porsche started from 23rd on the grid and amid a torrent of spray, but the experienced Rizzoli kept his cool during the opening stint to hand the car to Ashkanani in a promising position. The Kuwaiti driver was making his series debut at Monza, but this did not show as he fought his way past a number of Blancpain GT Series veterans and remained unphased through a number of safety car periods. Austrian ace Bachler took the controls for the deciding stint in second spot, with the #25 Sainteloc Racing Audi R8 LMS leading by four seconds as the race reached the decisive last 20 minutes. As the stint evolved Bachler began to take the upper hand, the Sainteloc-Audi struggling for pace and soon calling into the pits. The Dinamic-Porsche had no such problems and assumed the lead, from where Bachler expertly managed the closing stages to take a superb victory. He was followed home by the #563 Orange1 FFF Racing Team Lamborghini Huracan GT3 machine, driven for the final stint by Marco Mapelli, after an eventful outing for the Chinese squad. 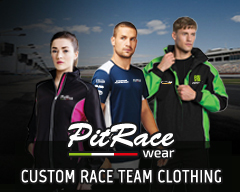 Like the Dinamic outfit FFF Racing was making its series debut at Monza having graduated from a title-winning Blancpain GT Series Asia campaign. Dennis Lind was ultra-competitive during the opening hour, while team co-owner Andrea Caldarelli managed the middle stint before handing over to Mapelli. Like Dinamic, it represented a statement of intent from the newcomer. The final spot on the podium belonged to the #4 Black Falcon Mercedes-AMG GT3 crew of Luca Stolz, Yelmer Buurman and Maro Engel. The reigning Endurance Cup champions had seemed out of contention after Stolz suffered contact during the opening stint but showed their title-winning prowess to climb the order back to third at the chequered flag. They very nearly missed out on a podium finish, however, as the #90 AKKA ASP Team Mercedes-AMG GT3 of Felipe Fraga threatened to overtake Engel on the final lap. The Brazilian eventually settled for P4 and, most importantly, a Silver Cup victory for the car he shares with Nico Bastian and Timur Boguslavskiy. The French squad led overall during the early stages and confirmed its status as a Silver crew capable of troubling the overall podium contenders this season. The Am Cup-winning crew also secured a superb overall finish, with the #77 Barwell Motorsport Lamborghini Huracan GT3 of Adrian Amstutz, Leo Matchiski and Miguel Ramos taking 16th overall and a dominant class win. Pro-Am honours went to the #93 Tempesta Racing Ferrari 488 GT3, giving the British squad a hard-earned win on its series debut. Reigning class champion Chris Buncombe carried over his fine 2018 form, tackling the opening stint before handing over to Jonathan Hui and finally Chris Froggatt. It capped a weekend on which a number of new squads signalled their intentions to fight for victory this season, pushing the standards of competition in the Blancpain GT Series to even greater levels. The next event on the schedule sees the Blancpain GT World Challenge Europe stage its maiden race, with Brands Hatch playing host to the sprint-format championship on 4/5 May. The Endurance Cup will resume just one week later when Silverstone completes a British double-header on 11/12 May. The established Endurance outfits will look to strike back at the Northamptonshire venue, but the Monza contest has shown that there are several new contenders with major ambitions for the season ahead.